Google Pixel 3 appears charging overheating problem: automatic shutdown can endure? Among them, the charging posture is diverse, no matter the original fast charge, three-way slow charge, Pixel Stand, etc., there are overheat warnings. 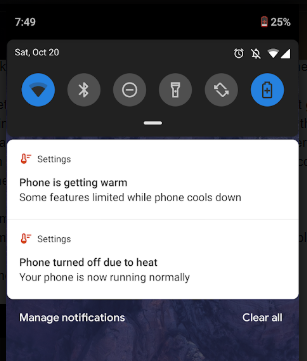 At this time, the mobile phone first pops up the overheat notification banner, then limits the charging speed, and if it does not improve, it will automatically shut down and cool down. Of course, it should be pointed out that these overheated users are often encountered when using side charging, especiallyvideoWhen you are on the phone or doing a live broadcast, you must know that this is a very serious injury to the battery and it is easy to accumulate heat. However, it is surprising that some users claim that their warranty has been resolved after the replacement. This year's Pixel 3 starts at $799, and such a badly heavy experience seems to be inconsistent with the "flagship identity."